Beautiful corner unit. Wrap balcony has awesome views of Gulf and Bay. The Beach Club is an A+ Beach Resort located on the Gulf of Mexico. Spoil your family and stay at the best! This is a Luxury, Non-Smoking, Corner Condominium just below the Penthouse with breathtaking panoramic views of the Gulf of Mexico and the Bay. Huge 50' wrap-around tiled balcony. Approximately 2000 square ft. condo with all the upgrades: tile flooring, crown molding, large flat screen TV in living area, flat screen TVs in each bedroom with CenturnLink TV package, and much more. The 2 king bedrooms have newly installed walk-in tiled showers. Professionally decorated and fully-equipped kitchen. The Avalon tower has a beautiful pool and hot tub available to our guests. We also provide a beach umbrella and beach chairs in our balcony closet so you don't need to rent them on the beach. Each tower's pool is surrounded by palm trees and lush landscaping. There is a clubhouse on site which offers a spa, a restaurant and bar, a small fitness center, and small game room. Eight tennis courts, basketball courts, soda shop, and nearby golf courses offer something for everyone. The restaurant, spa, tennis courts and basketball court are available to all Beach Club guests. If you choose to use Clubhouse pools (indoor and outdoor), the fitness center, or small game room, there is a daily guest fee payable directly to the Beach Club (pay at the Clubhouse). If you just want to relax on the beach and stay away from the hustle and bustle of a hectic, commercial beach area, then The Beach Club is the vacation spot for you! Sony docking station for IPod and Iphone. Large L shaped corner balcony overlooking ocean. Another balcony off queen BR w Bay view. Kiva Dunes is only 2 miles away. We very much enjoyed our stay at the Avalon. The condo has all essentials and provides a great floor plan for a large family to have plenty of space to stretch out. A few updates are needed to the decor, furniture, washer/dryer and kitchen items. The pools were supposed to be heated, but they were not. Overall, it’s a nice unit that needs some TLC. Terrific condo! Awesome view! Nancy was great! 10 of us stayed here for family spring break (6 adults, 4 teens). Plenty of room for all. Each bedroom having a private bath was really nice to have. Condo was very clean and being on the 20th floor the views were amazing. We were worried about elevator access on upper floor, but didn't have any issues. Only minor suggestion would be to have a channel guide for the TVs. We had tough time finding channels for NCAA Tourney games. We were very happy with our choice to stay here. Would stay here again without hesitation. This roomy condo was perfect for our extended family! Large open-concept kitchen/living area combination with surrounding windows opening onto a spacious balcony. Views from the 20th floor were spectacular. Kitchen was well-stocked. Master suite was roomy and the bath area had recently been remodeled so it was like new. We would love to stay here again! 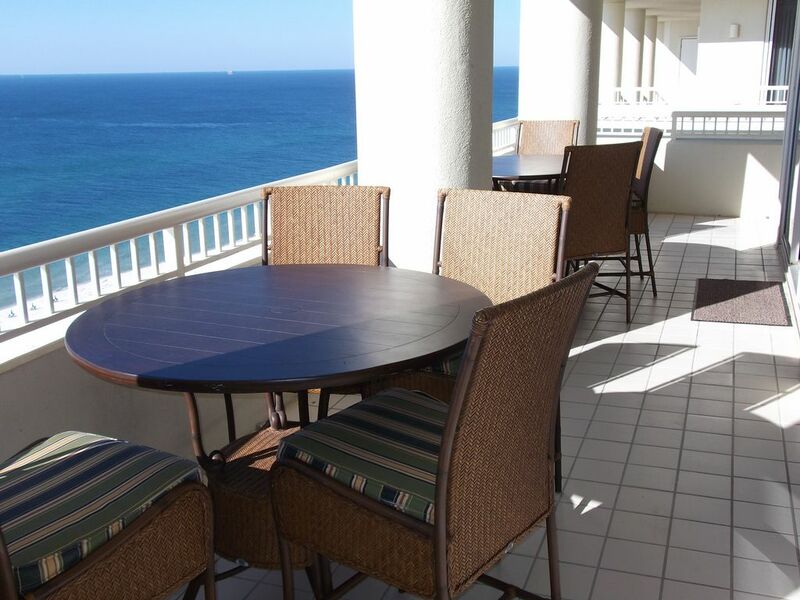 This is a fabulous well-equipped condo on the 20th floor of the Beach Club resort. It has stunning views of the beaches and gulf. The owner also supplies beach chairs and umbrellas which is very convenient. The resort is very well maintained, and clean. I would highly recommend staying at this condo, and hope to do so again in the future. Very nice, clean and spacious condo. Liked all the amenities onsite on the resort! The Beach Club Resort is a self-contained resort. Beach front condos with several pools, a Spa, beach front restaurant and bar, sports bar, tennis and basketball courts. !